Another ESP32 audio board was the similarly named ESP32-LyraT, and now we have at least more more option with Seeed Studio selling ESP32-A1S WiFi + Bluetooth ESP32 audio development kit for $16.90 on their store. The board also supports Espressif ESP-ADF framework, and you’ll find documentation such as schematics, user guides, and link to demos on the product page on Seeed Studio linked in the first part of this post. The kit targets the development of audio and audio IoT applications such as smart home devices, smart speakers, story machine solutions, and so on. I assume this is okay if you want to stream low fidelity mono at low sampling rates? I also assume not enough processing power to do much else. I’d like to see a board just like this with full duplex audio jacks in and out using an ARM chip and Linux, so there will be enough horsepower to stream high fidelity. But if the implementation is to provide the “ears” and perhaps the “voice” of an autonomous killing robot [which may get blown up by an IDE] for the military, monophonic output is all that is required to say “Stop and identify yourself!” (with translation to Arabic, Farsi, or Pashtu). Why are you assuming this ? There used to be a time where my 486 dx-50 was more than enough to read MP3s from the NFS server, decompress them and pass them to the sound card, in stereo at 44 KHz 16 bits. Why after so many years, new instruction sets and improved algorithms would this become hard to do on a dual-core system running at 5 times the frequency ? Of course if people try to download and decompress sound in Lua or NodeJS I could possibly understand, but we’re only talking about processing 88200 samples per second, that’s more than 5000 CPU cycles per input sample… Very often I’m seeing that people have been so much used to seeing horribly heavy applications (browsers?) that they believe basic stuff is impossible. Hint: if it reveals impossible, just remove the thick fat layer inserted between the hardware and the software. A quick glance at ESP-ADF documentation shows it handles a plethora of codecs at a plethora of sampling rates. This board runs ESP-ADF, so it should be more than capable of handling any kind of audio codec work. Assume less, read more (not referring to anybody, just as a general rule). From API docs you assume hardware performance? I hope I’m wrong, I hope this little board performs well. I’ll reserve judgment until somebody publishes a real-world review. Okay, but your 486 had a sound card for the CPU to offload to. 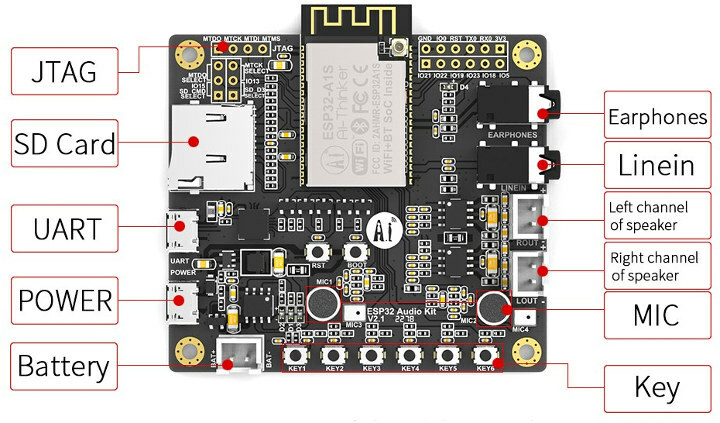 I notice the specs for the ESP32-A1S make no mention of the audio resolution. Is it 24 bit? 16 bit? 8 bit? That makes me skeptical. > Okay, but your 486 had a sound card for the CPU to offload to. I also used to do it at 18 kHz using the internal speaker and the PIT, using one interrupt per sample. Yes, PI0 was configured to tick 18k IRQs/s to send values to PIT2 reconfigured as a 6-bit PWM… All this while my DOS was working in the foreground, albeit quite slowly. Ah and it was running in 16-bit mode by then! But this is just to say that with such powerful hardware, it certainly is possible to do a lot. It’s not the chip size that should make us suspect low capabilities, audio needs have not much evolved. Even if you had 192kHz at 24bits, that would only be half a megabyte per second, or 20 times less than what a $1.50 16MB SPI NOR flash can deliver. It’s ridiculously low. There are good examples on high fidelity audio application using ESP32 – Espresif did what is needed to do 32bit 48K sample rate i2S audio interface clocks from internal audio grade PLL. The basic SDK do bluetooth and web mp3 audio streaming out of the box. So please expect more from the audio SDK. similar device gotenna / com but open source. sing in router, portable etc. Any idea why it has been discontinued almost immediately? Was really curious about such a well supported mcu along with good audio in/out capabilities. Sorry, I had to remove the link to Firefly store. The company is currently banned from CNX Software, since they own me money, albeit a small amount. Once the issue is resolved, it will be allowed again. Sad to hear that, it looked like a a good company, with a real willingness towards opensource. The amount is rather small (around $15) as it’s a reimbursement for custom duties. The company promised to reimburse them before we decide to go ahead, but never did even after 3 reminders. So there’s no need to write a post about it, I suppose it will be resolved next time they want to post something on CNX Software. Hi. 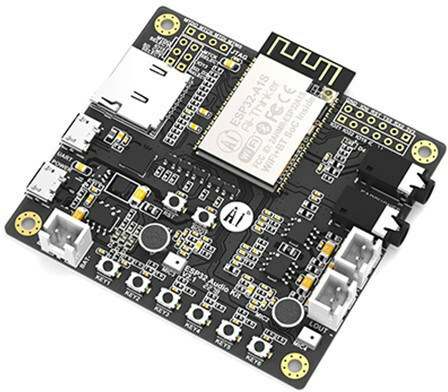 Where can I find examples made based on the module esp32-a1s audio development kit?